Next to Mexican Food, BBQ is my favorite. I totally love anything doused in bbq sauce along with the traditional side items of bbq fare. I anxiously await the local bbq contests each year when I get my fix of All-Out BBQ. Next to All-Out, we have some local favorites and make it a point to try bbq in our travels. For almost 2 years, Texas Tony’s has been serving up bbq in Naples. And, before last month, I had never been. That was until my 2 visits in less than 1 weeks time. Yeah, it was totally a Tasty Fellow. On both of my visits to Texas Tony’s, I had exactly the same thing. So, while I may vary my verbage here and then, both visits were the same – excellent from start to finish. 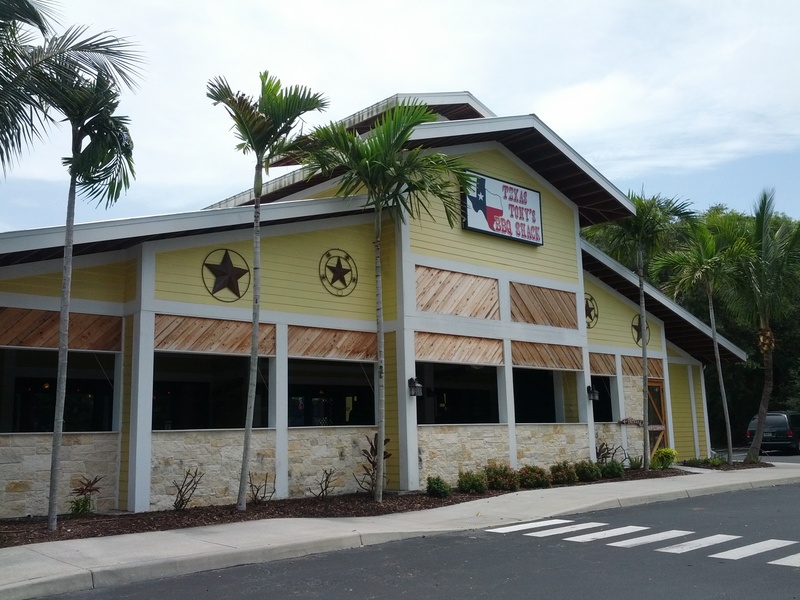 Texas Tony’s is located in South Naples, about 35 minutes from our house. Our first visit was during lunch and our next visit was for dinner. On both occasions, we had great customer service. After we were seated and brought our drinks, we decided to try the Onion Rings. 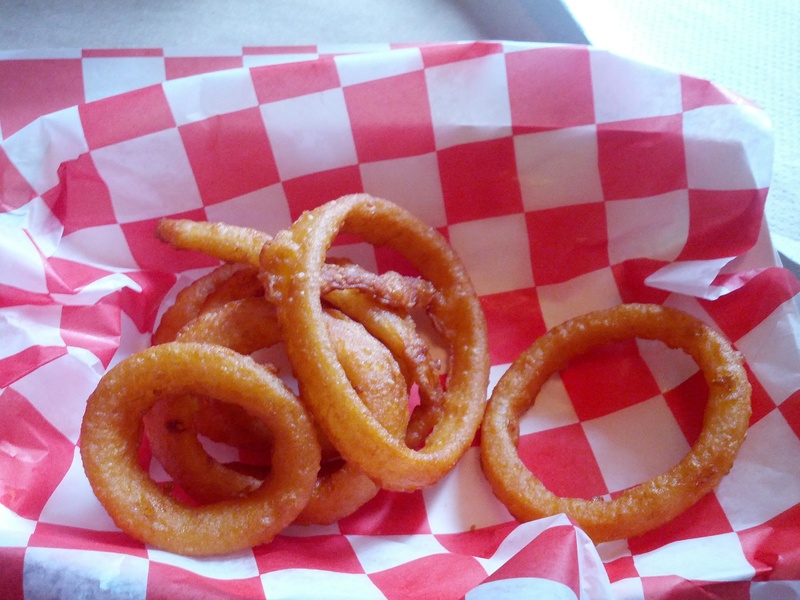 I found it odd that TT does not have Onion Rings listed as an appetizer but, they do have them as a side item. (I later found out this is because they have not perfected the creation of the O-Rings). We were brought a pretty tiny container of Onion Rings. On the outside, these looked like they may be all batter. However, once I bit in, I found the familiar onion center. I thought these onion rings were good but not fantastic. With the addition of some bbq sauce, they were tasty and a nice starter. I am so looking forward to when they perfect these suckers – I have no doubt they will be amazing. For my meal, I opted for the 1/2 BBQ Chicken with Fresh Cut Fries and Collard Greens for my sides. This was also served with a piece of Texas Toast. On both visits, we also ordered an extra order of fries for everyone to share. Let’s start here then…with the fries. Oh. My. Gosh. 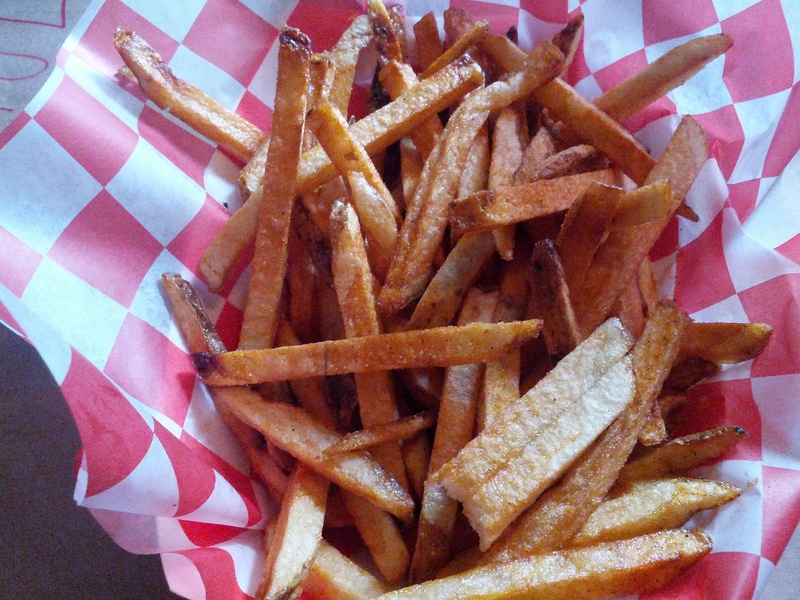 These are the best fresh cut fries ever (they may even be a step above Penn Station). Absolutely amazing from start to finish. Each fry has a crazy fresh flavor and just enough salt & seasoning to make them ohh so delicious. The fries have the skin left on and are fried up to done but not over done. From the top of the basket to the bottom of the basket, every fry was amazing. Words can not describe how much I love these fries. I not only ate all of the fries on my plate but, a good chunk of the shared fries. So amazing. If the food sucked, I would return again and again for these killer fries. I really enjoy Collard Greens yet, I can count on one hand how many times I have ordered them in a restaurant. My fear is always that they will be a soggy & sugary mess. So is not the case at TT. These greens are fantastic – within the top 2 that I have ever eaten. Every bite of greens is moist & flavorful. Even with the moist factor, these greens are in no way soggy. The taste, while subtle, screams of sugar and grease. I loved how these flavors played up the extreme bitterness of pre-cooked greens. I could have eaten two more of these containers. As for the Texas Toast? Great as well. The piece was large with a crispy exterior & soft interior. The flavors were subtle and mixed perfectly with the bbq sauce. And, while we are on sauce, TT serves up some good sauce. Options are Spicy or Sweet and I opted for the Sweet. The sauce is very thin in consistency however, it packs a punch. I would describe it as a seasoned sweetness – flavors of smoky bbq mixed in with good ol’ sweetness. I dipped a good lot of my chicken into the sauce along with the fries & Texas Toast. My chicken portion was huge and was all smoked. I removed the skin of the chicken and found a huge amount of pink chicken – a good thing since this is smoked. The chicken was tender & fall off the bone – in no way was it dry or undercooked. I could distinctively taste the smoke in this chicken and I so loved it. Even though I dipped a lot into the sauce, the chicken was stand-alone all on its own – no sauce needed. I have no idea why it took my nearly 2 years to visit Texas Tony’s. While it is a good distance away, it is so worth the drive. I plan on returning again in the future and making it part of my usual BBQ restaurant routine. For me, these sides were probably the best of any bbq place in Naples. 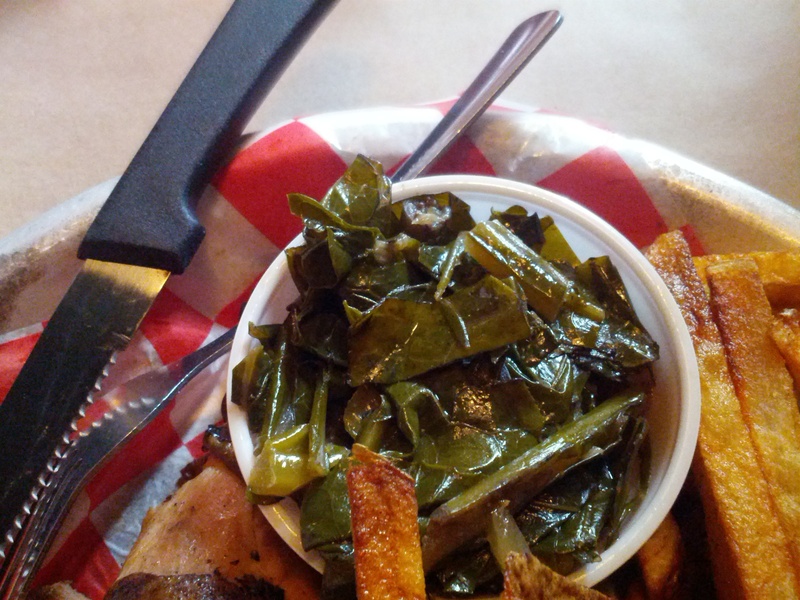 Hands down the best fries and collard greens – mmm…the thought of them makes me salivate. 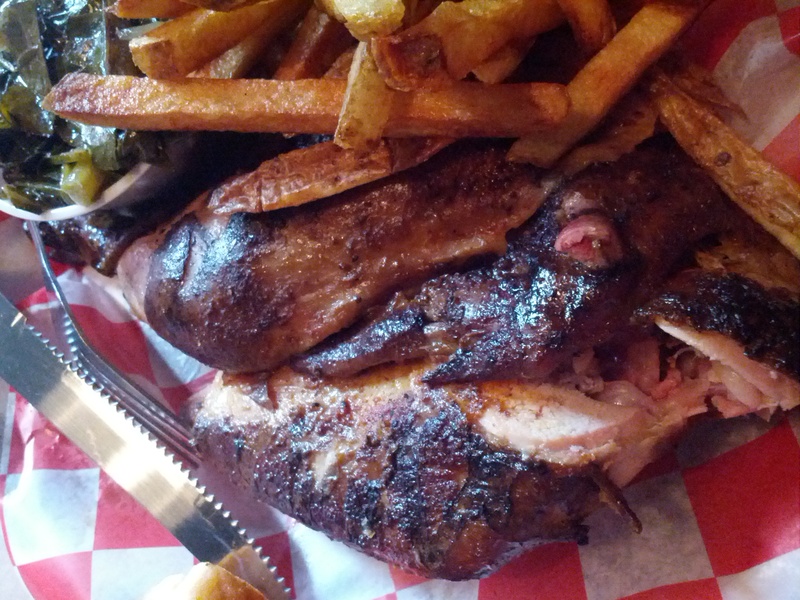 Plus, the smoked bbq chicken was great as was the sauce & Texas Toast. The only thing I didn’t love was the onion rings but, the rest of the meal made up for them. If you are in the Naples area, do yourself a favor and get to Texas Tony’s. You will leave telling Tony that he is one Tasty Fellow.